Goliathcasino is a brand owned by Goliath Ltd, a company incorporated under the laws of Malta. The games on this website are powered and operated by Aspire Global International LTD. Aspire Global International LTD (or "The Company") is a company registered in Malta for the purposes of operating and offering of online and mobile application games and sports betting services with registration number C42296 and registered office at 135 High Street Sliema Malta. The Company is licensed and regulated by the Malta Gaming Authority under the license no. MGA/B2C/148/2007 issued on the 17 August 2009 (this license incorporates the previous licenses held by the Company and list the old license numbers with their license dates). Aspire Global International LTD have an Irish Betting License with license reference number 1014834. The Company provides online and mobile gaming services to You (the "Company The Company Services") subject to the following terms and conditions contained within this end user license agreement (the "Agreement") which should be read carefully by You in its entirety prior to Your use of the Company Services or products. Please note that the Agreement constitutes a legally binding agreement between You and the Company. By registering with The Company and/or by using The Company's Services, You agree to be bound by this Agreement in its entirety and without reservation. If You do not agree to any of the provisions of this Agreement You should immediately stop using The Company Services and remove the RVG Games from your computer and mobile device. When playing in Sweden, the contracting entity with respect to the Agreement is AG Communications LTD. AG Communications LTD is licensed and regulated by the Swedish Lotteriinspektionen with license number 18Li7458. Us, We or Our shall refer to The Company, and/or any subsidiaries, affiliates, directors, officers, employees of Aspire Global International LTD.
White Label Partner shall mean an entity which is an owner of an Internet site and/or mobile device company which provides certain functions, such as marketing and promotion, in connection with The Company Services. You, Your or User shall refer to the user of The Company Services for Free Practice Play and/or Real Money Play games. 2.1 The availability of The Company Services does not construe an offer or invitation by Us to use The Company Services if you reside in a country or region in which such use is currently forbidden by law, or within any jurisdiction where The Company, in its sole discretion, elects not to offer The Company Services. 2.2 You accept sole responsibility for determining whether Your use of The Company Services is legal in the country/region where You live and/or in any country/region where You log on to use The Company Services.The Company shall not be responsible for any illegal or unauthorized use of the The Company Services by You as We are unable to verify the legality of use in each jurisdiction and it is Your sole responsibility to verify the legality of using The Company Services prior to logging on to The Company Services. Please consult legal counsel in the applicable jurisdiction if You have any doubts about the legality of Your use of The Company Services under the laws of any jurisdiction that applies to You. 2.3 By law, You may only use the Services if you are eighteen (18) years old, or of legal age as determined by the laws of the country where you live which shall only be valid if the age of majority in your jurisdiction is eighteen (18) years or higher ("Legally of Age"). We reserves the right to withhold any funds in Your account until your age is verified. 2.4 We reserve the right at any time to request from You evidence of age in order to ensure that minors are not using The Company Services. We further reserve the right to suspend or cancel Your Player Account and exclude You, temporarily or permanently, from using The Company Services if satisfactory proof of age is not provided or if We suspect that you are underage and such satisfactory proof is not provided by You within five (5) days of our requesting such proof, Your Player Account shall be closed and You shall forfeit all funds in Your Player Account, such decision shall be final, binding and not subject to appeal. When playing in Sweden, if satisfactory proof of age is not provided or if We suspect that you are underage and such satisfactory proof is not provided by You within thirty (30) days of our requesting such proof, Your Player Account shall be closed in accordance with applicable regulations. We further reserve the right to refuse and/or limit bets and/or wagers. 2.5 During their engagement period and for a period of 24 months thereafter, no officer, director, employee, consultant or agent of The Company or any of its affiliated companies or its suppliers, vendors or White Label Partners is permitted to use The Company Services directly or indirectly, nor is any supplier or vendor. This restriction also applies to relatives of such persons and for this purpose 'relative' includes, but is not limited to, any of a spouse, partner, parent, child or sibling. 3.1 For the avoidance of any doubt, The Company is the owner or licensee of the copyright, trademarks and other intellectual property rights and/or the Interactive System and the RVG Games offered via The Company Services. Players and prospective Players acquire no rights therein by using The Company Services. In addition, other content related to The Company Services, including, but not limited to, the software, images, pictures, graphics, photographs, animations, videos, music, audio and text (the "Site and Mobile Content") belong to The Company or one of its companies and/or its licensors and is protected by copyright and/or other intellectual property, or other rights. Players and prospective Players acknowledge and agree that they are only permitted to use The Company Services as expressly set out in this Agreement and such Players and prospective Players obtain no rights in the Site and Mobile Content, or any part thereof. Under no circumstances You may use the Site and Mobile Content without The Company's prior written consent. 3.2 All content and use of The Company Services is for personal, non-commercial use only. All other use is strictly prohibited and You will be solely liable for any damages, costs or expenses arising out of or in connection with the commission of any prohibited activities. In order to login and play RVG Games via The Company Services, whether for Free Practice Play or for Real Money Play, you will have to open a Player Account which will constitute Your Company identification thereafter for as long as You use The Company Services. 4.1.1 You are at least 18 years of age or such higher minimum legal age of majority as stipulated in the laws of jurisdiction applicable to You and, under the laws applicable to You. 4.1.3 Your Company Player Account is for Your personal use only and funds deposited into your Player Account may only be used to play via The Company Services. Verifications procedures will be carried out when you deposit funds in your Account. You may not use Your Player Account on behalf of another person. You may only create one Player Account with The Company and shall only use The Company Services using such single Player Account. Any use of Your Player Account is strictly for Your own private purposes. We take absolutely no responsibility for any third party accessing Your Player Account and We shall not be liable for any losses incurred by You as a result of such an event. Any activation of Your Player Account while using the correct Password and Username will be considered by Us as a valid entry by You into Your Player Account. Should You become aware of any unauthorized use of Your Player Account You are obligated to immediately notify us and we will suspend your Player Account pending further investigation of such unauthorized use. 4.1.4 Any funds held in your Player Account do not accrue interest. You will not be able to place any bets using The Company Services in an amount greater than the total amount of money in Your Player Account. You shall not treat The Company as a financial institution. 4.1.5 You are fully responsible for paying all monies owed to The Company. You agree not to make any chargebacks, and/or deny or reverse any payment made by You in respect of The Company Services. You will reimburse Us for any chargebacks, denial or reversal of payments You make and any losses suffered by Us as a consequence. 4.1.6 You do not already have an existing Player Account with Aspire Global International LTD in Your name and/or You are not using The Company Services through someone else's Player Account using Your credit card information. Should You attempt to open more than one Player Account, under Your own name or under any other name, or should you attempt to use The Company Services by means of any other person's account, We will be entitled to immediately close all Your accounts, retain all monies in such accounts and bar You from future use of The Company Services. 4.1.7 You fully understand the methods, rules and procedures of The Company Services and Internet gambling in general. You understand that it is your responsibility to ensure the details of bets and games are correct. You will not commit any acts or display any conduct that damages the reputation of The Company. 4.1.8 You are solely responsible for recording, paying and accounting to any relevant governmental, taxation or other authority for any tax or other levy that may be payable on any winnings paid to You. 4.1.9 You are solely responsible for any telecommunications networks and Internet access services and other consents and permissions required in connection with Your use of The Company Services. 4.1.10 You are not a resident of the United States of America. Never write or otherwise record Your Username or Password in a way that can be understood by someone else. Never divulge Your Username and Password to any other individual. Avoid Username and Password details that may be easy to guess such as birthdays/telephone numbers, spouses and/or children's names, etc. Inform us immediately (by contacting Our support team) of any unauthorized access to Your Player Account or any suspicion that someone else knows Your Username and Password. 4.3 You shall be solely responsible for all transactions conducted in relation to your Player Account using your Username and Password. Every person who identifies himself/herself by entering Your correct Username and Password is assumed by Us to be You and all transactions where the Username and Password have been entered correctly will be regarded as valid and authorized by You. 4.4 The Company retains full authority over the issuing, maintenance, and closing of Player Accounts at The Company. However contractual obligations already made will be honored. The decision of The Company management as regards any aspect of a User's Player Account and use of The Company Services is final, binding and shall not be open to review or appeal. 4.5.1. If you have not logged in to Your Player Account for twelve (12) consecutive months then your Player Account will be considered a "dormant account" and We will charge a5€ monthly maintenance fee on the balance of such dormant account. If your Player Account remains dormant for more than thirty (30) months, We will remit Your Player Account balance (if any) to You, after deducting the necessary fees. If Your current location is unknown or You have failed to provide up to date means of making such remittance, the remaining funds (if any) shall be transferred to the Malta Gaming Authority (MGA). 4.5.2 The first monthly maintenance fee will be charged at the end of the last month after which your account became dormant. The monthly maintenance fee shall not be charged if there are no funds in the dormant account. 4.7 It is your responsibility to make sure that you read and understand all the rules and procedures of the RVG Games on the Website(s) including without limitation, the Games Rules and the Games Procedures, prior to playing Real Money Play games or bets. 4.8 It is prohibited for you to transfer, sell and/or acquire player accounts to and from other players, and it is further prohibited to transfer funds amount player accounts. 4.9 You may close Your account at any time and We will return to You any and all funds from Your Player Account subject to the deduction of relevant withdrawal charges. To close Your Player Account You should contact customer support in written form. The effective closure of the Account will correspond to the termination of the T&C. In case the reason behind the closure of the Account is related to concerns about possible gambling addiction the Player shall indicate it. The method of repayment will be at our absolute discretion All Retention procedures need to be reviewed and considered. Any depositing player who asks to close his account will be subjected to retention attempts. Retention procedure include contacting You through different channels for clarifying the reason for the request and specific treatment in order to solve possible problems to improve the customer satisfaction. 4.10 Your Player Account is made up of a real money funds balance and a bonus funds balance. If you have both real money funds and bonus funds in your Player Account, the next wager you make will use real money funds first. If your you place a bet where the real money funds in your Player Account is not sufficient to cover such bet and you use bonus funds to cover the rest of such bet, your winnings from any such bet placed by you, will be paid to you in proportion to the real money funds and bonus funds you have used to place such bet. By way of example only, if you place a bet of £10 (ten pounds), of which such bet is made up of £4 (four pounds) from your real money balance and £6 (six pounds) from your bonus balance and such bet generates a win of £30 (thirty pounds), your Player Account will be credited with £12 (twelve pounds) to your real money balance and £18 (eighteen pounds) in bonus funds to your bonus balance. All such winnings generated by bonus funds will be subject to the terms of the Bonus Policy. 4.11 You may at your discretion choose to exclude yourself from using The Company for a definite or an indefinite period. In order to block your access to The Company Services you may send an email to care@Goliathcasino.com; you may use the cooling off period function where you can suspend your account. For further information please see our Responsible Gaming Policy . The Company Interactive System is a secured environment which only allows a Player to access The Company Services if such Player has passed through our secured networks which use state of the art encryption for Username and Password data. You will not be able to access The Company Services without passing through our customer security login process, and any Player who bypasses our Interactive System shall be prosecuted to the full extent of the law. 6.1.1 You are not depositing funds originating from criminal and/or un-authorized activities. 6.1.2 You are not otherwise conducting criminal activities and/or intending to utilize your Player Account in connection with such activities. 6.1.3 You are not using or intending to use or intending to allow any other person to use your Player Account in relation to The Company Services for any prohibited or unlawful activity, including but not limited to, fraud or money laundering, under the laws of your jurisdiction or any other applicable laws in any other jurisdiction. 6.1.4 The credit/debit card details, or those of any other means of payment used to deposit funds in Your Player Account, given by You when you register to use The Company Services, are those of the registered Player Account holder and such cards are not stolen or reported lost. Without derogating from the aforementioned, should You use a credit/debit card or any other form of payment which is not in Your private and personal name, We will presume that You have received complete and sufficient consent from the rightful owner and/or the person whom name is used on such payment instrument to make use of such payment instrument for the purposes herein, prior to Your engagement with Us. 6.1.5 You have not held a Player Account with Us that was terminated or suspended, and You have not notified Us, now or in the past, that You have a gambling addiction. 6.1.6 You shall not break in, access or attempt to break in to The Company Services. In any case of suspected break-in to The Company Services we shall immediately terminate Your Player Account, seize all funds available through that account pending our investigation, and notify the relevant authorities. 6.1.7 You shall not intentionally disconnect from a RVG Game while using The Company Services. If We determine, in Our sole discretion, that You are in breach of this clause, We may terminate Your access to The Company Services immediately and/or have Your Player Account blocked. If Your Player Account is terminated or blocked in such circumstances, We are under no obligation to refund You any funds that may be in Your Player Account. 6.1.8 You shall not be involved in any fraudulent, collusive, fixing or other unlawful activity in relation to Your or third parties' participation in any of the Games. 6.2 If any suspicious, improper, fraudulent, or unlawful activities are attempted and/or performed through the use of The Company Services We will be entitled to terminate and/or block your Player Account and seize all funds available through that account. We also reserve the right to disclose any and all details of your Player Account to the relevant authorities. 6.3 Artificial Intelligence - Robots: You are not allowed to use any software program which, in our opinion, is endowed with artificial intelligence ("AI Software") in connection with your use of the Services. We constantly review the use of the Services in order to detect the use of AI Software and in the event that we deem it has been used we reserve the right to take any action we see fit, including immediately blocking access to the Services to the offending user, terminating such user's account and seizing all monies held in such account. 7.1 For the avoidance of doubt it is hereby declared that when referring to currency in this Agreement the currency stated shall either be Euro and/or any other currency accepted by Us and in accordance with the Player's choice of currency in his/her Players Account. 7.3 You understand that all financial account transactions will be handled by Us, or third party electronic payment processors and/or financial institutions on Our behalf and checks on financial account transactions shall be done to prevent money laundering. To the extent that they do not conflict with the terms of this Agreement, You agree to be bound by the terms and conditions of such third party electronic payment processors and/or financial institutions. We reserve the right to run credit checks with third parties using the information submitted to Us by You through the opening of the Player Account or by any other means. 7.4 We reserve the right to refuse accepting and paying through any means of payment, such as certain credit cards, personal checks, electronic wallets and any other types of payment methods. We reserve the right to credit You back using the same method as You have previously deposited with, for as long as the method so used allows. 7.5 You understand that by accepting a bonus payment offered by Us to You, You are bound by the rules and regulations of Our Bonus Policy. 7.6 We may, at any time, set off any positive balances in Your Player Account against any amount owed by You to Us. By way of example, in the event that following the settlement of a bet in Your Player Account a resettlement is required, The Company shall be entitled to deduct from Your Player Account any required amount of money. 7.7 All payments into Your Player Account must be from a single payment source, such as a credit card, debit card or charge card, on which You are the named account holder. Deposit limits may apply depending on a number of parameters. We reserve the right to charge you administrative fees during your deposits and withdrawals as shall be detailed in the "Cashier". • E-PRO is a payment solution providedby EMP Corp, an E-money agent, based on E-money and E-wallet. • E-PRO is an E-Voucher issued by EMP Corp, being resold by First Remit Limited (UK), a registered money service business with Her Majesty's Revenue and Customs certificate number 12679642 & fully authorizedby the UK Financial Conduct Authority (FCA) as a payments institution, with reference 622935. • E-Pro e-Vouchers resold by First Remit will show in your card statement as "Online Payment". • An E-VOUCHER, constituting electronic money, is generated in the event of an intervention by EMP Corp to pay for the services offered on the MERCHANT SITE. • If the payment service provider is EMP Corp, the transaction will result in the creation and purchase of electronic money issued by an E-money Issuer, to be used to credit an E-wallet. 8.1 No refund can be completed for funds subject to wagering requirements or restrictions. 8.2 A refund request will only be considered if it is requested within the first twenty-four (24) hours of the alleged transaction, or within thirty (30) days if a Player alleges that another individual (or a minor) has accessed his/her Player Account. 8.3 If Your request for a refund or reverse transaction gives Us grounds to require further verification of Your identity in order to comply with Our legal and/or regulatory obligations or to prevent unlawful or fraudulent behaviour, We may withhold any refund or reverse transaction until Your identity has been verified in accordance with applicable law. Such circumstances which may require Us to perform such further identity checks include (but are not necessarily limited to) where: (i) You request that a refund be made via a different payment than that used for making deposits to Your account; or (ii) there are reasonable grounds to suggest that a Player Account User has not set up the Player Account on his/her own behalf (and has done so on behalf of someone else, i.e. a third party). When conducting the identity checks referred to in this Section [8.3], We shall require such additional verification as is permitted under applicable law to ensure that Our legal and regulatory obligations are satisfied. In the event that You fail to satisfy Our requirements for further verification of Your identity, We shall take such steps as We are required to take to ensure that We comply with Our legal and regulatory obligations. This may require Us to refuse Your request for a refund or reverse transaction, close Your Account and could result in a forfeiture of funds. You may not be entitled to appeal such action, except where such right of appeal is required by applicable law in the country or state in which You live and this is not prevented by Our own legal and regulatory obligations. 9.2 We will use best efforts to resolve a reported matter promptly. Complaints will be escalated internally according to the urgency and nature of the complaint, and once a solution has been identified it will be made known to You immediately. 9.3 If You have a query with regard to any transaction, You may also contact Us with details of the query. We will review any queried or disputed transactions. Our judgment is final. 9.4 If for some reason You are not satisfied with the resolution of Your complaint by Us, You can complain either our appointed ADR service, ThePOGG.com, or the Malta Gaming Authority. 9.5 If you are playing from the European Union, you can refer any dispute you have in connection to the services provided by the Company through the European Commission's Online Dispute Resolution Platform available at europa.eu/consumers/odr. THE RVG GAME, INTERACTIVE SYSTEM, AND THE SITE AND MOBILE CONTENT ARE PROVIDED "AS IS". WE MAKE NO WARRANTY OR REPRESENTATION, WHETHER EXPRESS OR IMPLIED (WHETHER BY LAW, STATUTE, OR OTHERWISE), INCLUDING BUT NOT LIMITED TO IMPLIED WARRANTIES AND CONDITIONS OF MERCHANTABILITY, SATISFACTORY QUALITY, FITNESS FOR A PARTICULAR PURPOSE, COMPLETENESS OR ACCURACY OF THE RVG GAME, INTERACTIVE SYSTEM, OR THE SITE AND MOBILE CONTENT, OR INFRINGEMENT OF APPLICABLE LAWS AND REGULATION. WE MAKE NO WARRANTY THAT THE RVG GAME, INTERACTIVE SYSTEM, AND THE SITE AND MOBILE CONTENT WILL MEET YOUR REQUIREMENTS, BE UNINTERRUPTED, TIMELY, SECURE OR ERROR-FREE, THAT DEFECTS WILL BE CORRECTED, OR THAT THE SOFTWARE OR THE SERVER, OR THE MOBILE DEVICE, THAT MAKES IT AVAILABLE ARE FREE OF VIRUSES OR BUGS OR REPRESENTS THE FULL FUNCTIONALITY, ACCURACY, RELIABILITY OF THE MATERIALS OR AS TO RESULTS OR THE ACCURACY OF ANY INFORMATION OBTAINED BY YOU THROUGH THE COMPANY SERVICES. IN THE EVENT OF SYSTEMS OR COMMUNICATIONS ERRORS, BUGS OR VIRUSES RELATING TO ACCOUNT SETTLEMENT OR OTHER ELEMENTS OF THE COMPANY SERVICES OR RESULTING IN LOSS OF DATA BY YOU OR ANY OTHER DAMAGE TO YOUR COMPUTER EQUIPMENT OR SOFTWARE, OR MOBILE DEVICE, WE SHALL IN NO WAY BE LIABLE TO YOU AND WE RESERVE THE RIGHT TO VOID ALL RVG GAMES IN QUESTION AND TAKE ANY OTHER ACTION TO CORRECT SUCH ERRORS SAVE THAT WE ARE NOT REQUIRED TO PROVIDE ANY BACK UP NETWORK AND/OR SYSTEMS OR SIMILAR SERVICES. WE SHALL NOT BE LIABLE FOR ANY ACTS OR OMISSIONS MADE BY YOUR INTERNET SERVICE PROVIDER, OR MOBILE DEVICE COMPANY, OR OTHER THIRD PARTY WITH WHOM YOU HAVE CONTRACTED TO GAIN ACCESS TO THE SERVER THAT HOSTS THE COMPANY SERVICES. 11.2 Your decision to use The Company Services is made at your own discretion and risk. 11.3 We shall not be liable in contract, tort, negligence, or otherwise, for any loss or damage whatsoever arising from or in any way connected with Your use of The Company Services whether direct or indirect, including, without limitation, damage for loss of business, loss of profits, business interruption, loss of business information, or any other pecuniary or consequential loss (even where We have been notified by you of the possibility of such loss or damage). 11.4 We shall not be liable in contract, tort, negligence, or otherwise, for any loss or damage whatsoever arising from or in any way connected with Your use, of any link used in connection with The Company Services. We are not responsible for the content of any linked sites. 11.5 You confirm that We shall not be liable to you or any third party for any modification to, suspension of or discontinuance of The Company Services. b. If any such errors result in an increase in winnings owed or paid to You, You shall not be entitled to the winnings falling within such increase. You shall immediately inform the Company of the error and shall repay any winnings credited to Your Player Account in error to The Company (as directed by The Company) or The Company may, at its discretion, deduct an amount equal to those winnings from Your Player Account or set off such amount against any money owed to You by The Company. 12.1 In the event of a game, bet or system malfunction all bets and/or wagers are void. 12.2 In the event a game or bet is started but miscarries because of a failure of the system, The Company shall refund the amount wagered in the game or the bet, as applicable, to You by crediting it to the Your Player Account or, if the account no longer exists, by paying it to You in an approved manner; and if You have an accrued credit at the time the game miscarried, credit to Your Player Account the monetary value of the credit or, if the account no longer exists, pay it to You in an approved manner. 12.3 If The Company mistakenly credits You with winnings that do not belong to You, whether due to a technical or human error or error in the published pay tables or gaming software, or otherwise, the amount will remain property of the Company and the amount will be transferred from Your Player Account. If prior to The Company becoming aware of the error You have withdrawn funds that do not belong to You, without prejudice to other remedies and actions that may be available at law, the mistakenly paid amount will constitute a debt owed by You to The Company. In the event of an incorrect crediting, You are obliged to notify The Company immediately by email. 13.1 You agree to fully indemnify, defend and hold Us, and Our officers, directors, employees, agents, contractors and suppliers, harmless, from and against all claims, liabilities, damages, losses, costs and expenses, including legal fees, arising out of any breach of this Agreement by You, and any other liabilities arising out of Your use of The Company Services or use by any other person accessing The Company Services using Your User identification, whether such use is with or without Your knowledge and/or express authorization. 13.2 In addition to any other remedy available, if you breach any of these terms and conditions of this Agreement or The Company has reasonable grounds for suspecting that You have breached the terms and conditions of this Agreement, in addition to any other remedies available to The Company, Your winnings may be forfeited at the discretion of The Company and The Company may retain any positive balance then existing in Your Player Account on account of any damages or other amounts owed by You to The Company pending investigation and/or the conclusion of any legal proceedings. Failure to comply with this Agreement may also result in disqualification, Player Account closure and/or legal action being taken against You. 14.1 We reserve the right to change these Terms of Service, the Games Rules, Bonus Policy and Cash Out Policy at any time, so we encourage you to re-visit this page frequently to be updated of any amendments to these terms. We will provide prior notice to you through your account of substantial changes of these Terms of Service (and any related terms) and/or we will send you an e-mail regarding such changes to the e-mail address linked to your account. Such substantial changes will take effect seven (7) days after such notice was provided on any of the above mentioned methods. Otherwise, all other changes to these Terms of Service are effective as of the stated “Last Revised” date, and your continued use of the Services after the Last Revised date will constitute acceptance of, and agreement to be bound by, those changes. 15.1.3 You shall not make statements that advertise, promote or otherwise relate to any other online entities. 15.1.4 You shall not make statements about The Company, The Company Services, or any other Internet site(s) connected to The Company that are untrue and/or malicious and/or damaging to The Company. 15.1.5 You shall not collude through the chat rooms or separate chats. PLEASE NOTE: When using the chat facility any personally identifiable information that You submit, can be read, collected, or used by The Company, and The Company is not and shall not be responsible for the personally identifiable information that You choose to submit via the chat facility.Suspicious chats will be reported to the appropriate authorities. 16.1 Before a prize will be paid on any winning RVG Game, it must be validated according to this Agreement and the rules and procedures set by The Company. We reserve the right to make the sole and final decision as to the RVG Game's winning status and Our decision will be final, binding and subject not subject to appeal. 16.2 We may, at Our sole discretion, refuse to register and provide a Player Account to any individual or close a Player Account, and to limit or refuse a wager. Subject to the provisions of this Agreement, in the event a Player Account is closed or refused, We shall honor the contractual obligations already entered into. 16.3 By signing this Agreement and ticking the appropriate box upon registration You hereby agree to receive any communications or advertising from The Company regarding its services or products including by electronic mail and SMS. Should You wish to "opt-out" of receiving communication from us at any time please let us know by sending a blank message with the word "remove" to support@Goliathcasino.com. Should You wish to "opt-out" of receiving SMS marketing messages communication from us at any time please let us know by replying "stopmessage" to any of our SMS sent to you. 16.4 We reserve the right to suspend, change, modify, add or remove any RVG Game(s) used by The Company Services without any prior notice to Our Players and with immediate effect. We shall not be liable for any loss suffered by You resulting from any changes made and You shall have no claims against The Company in such regard. 16.5 We reserve the right to offer, from time to time, bonuses and/or promotions and special offers and that any such offer will be subject to its own rules and conditions. We reserve the right to withdraw any of these special offers and bonuses at any time. In the event that The Company believes a user of The Company Services is abusing or attempting to abuse a bonus or other promotion, or is likely to benefit through abuse or lack of good faith from a gambling policy adopted by The Company, then The Company may, at its sole discretion, deny, withhold or withdraw from any user any bonus or promotion, or rescind any policy with respect to that user, either temporarily or permanently, or terminate that user's access to The Company Services and/or block that user's Player Account. In addition, we The Company reserves the right to decline any pending cashout under these conditions. 16.6 You agree that We may, at our sole discretion, assign this Agreement, in whole or in part, to any third party or person upon prior notice to you, and you will be deemed as having given you to consent to such assignment if You continue using The Company Services following receipt of such notice. 16.7 You understand that you will receive electronic communications from us, posted via the Aspire Global International LTD Services and/or sent to you via e-mail. All such communications will be considered "in writing" and will be considered received by you after 4 business days, whether you have actually received them or not. 16.8 The enforceability or validity of any part of this Agreement shall not affect the validity and enforceability of the remainder of this Agreement. 16.9 This Agreement contains the entire agreement between You and Us relating to use of the Aspire Global International LTD Services. 16.10 This Agreement has been drafted in the English language. In the event of any discrepancy between the meanings of any translated versions of this Agreement and the English language version, the meaning of the English language version shall prevail. 16.11 No waiver by Us of any terms of this Agreement shall be construed as a waiver of any preceding or succeeding breach of any terms of this Agreement. 16.12 Unless otherwise expressly stated, nothing in this Agreement shall create or confer any rights or any other benefits to third parties. 16.13 Nothing in this Agreement shall be construed as creating any agency, partnership, trust arrangement, fiduciary relationship or any other form of joint enterprise between You and Us. This Agreement shall be governed by, and interpreted in accordance with, the laws of Malta you irrevocably submit, for Our benefit, to the exclusive jurisdiction of the courts of Malta to settle any disputes (including claims for set off and counterclaims) which may arise in connection with the creation, validity, effect, interpretation or performance of, or the legal relationships established by, this Agreement or otherwise arising in connection with this Agreement. This Agreement has been updated on 6.1.2019. 18.1. These Betting Rules are inseparably linked to our Terms & Conditions, of which they form a part, and acceptance of these Betting Rules is a prerequisite to account registration. Any capitalized terms used herein which are not defined shall take their meaning from the Terms & Conditions. 18.2. The minimum amount you may wager on our sports betting products is £0.10. Your maximum amount for a bet differs between sports, leagues and bets. You will see the exact value specified in the field where you enter the stake amount, when placing a bet. We make no guarantee that any bet placed within or for the maximum stake shall be accepted. Terms & Conditions. 18.3. We reserve right to refuse the whole or any part of any bet request for any reason and at our sole discretion. Individual bet requests may be reviewed and an alternative price or stake offered at our sole discretion. 18.4. We accept bets made online. Bets are not accepted in any other form (email, telephone, fax, etc.) and if received will be void, win or lose. 18.5. We reserve the right to refuse/cancel any bet or part of a bet before the game starts and to make ambiguous bets void, without providing any justification. 18.6. Customers cannot cancel or change a bet once the bet has been placed and confirmed. 18.7. Bets will be accepted up to the advertised start time. If a bet is inadvertently accepted which includes an event after its start time, unless it is a live-betting event, the match/bet will be treated as a non-runner. 18.8. Irrespective of which betting odds format you select for odds to be shown in your customer account, all bets will be settled based on American odds. 18.9. Where we have reason to believe that a bet is placed after the outcome of an event is known or after the selected participant or team has gained a material advantage (e.g. a score, sending off etc.) we reserve the right to void the bet, win or lose. 18.10. We reserve the right to cancel any bets from customers who place money on an event where they are in any way involved, as participants, referee, coach etc. 18.11. We reserve the right to withhold payment and to declare bets on an event void if we have evidence that the following has occurred: (i) the integrity of the event has been called into question or (ii) match rigging has taken place. Evidence may be based on the size, volumes or pattern of bets placed with Aspire Global International LTD across any or all of our betting channels. 18.12. When an event is cancelled, all related bets will be void automatically and accounts refunded. 18.13. If any match is abandoned due to injury, bad weather, crowd trouble etc. all bets that have already been settled up until the time of abandonment will stand. For example: If a football match is abandoned in the second half, all bets involving the 1st half will stand. What’s more, if there has been a goal scored, the first goal scorer market will stand, but the last and any time goal scorer bets will be void. For tennis: if a player retires injured in the 3rd set, all bets to win the 1st and 2nd sets will stand. 18.14. We do not accept any responsibility for typing, human or palpable errors, which lead to obvious price errors. In such cases all bets will be deemed void. 18.15. Multiple bets that combine different selections within the same event are not accepted where the outcome of one affects or is affected by the other. If such a bet is taken in error, the bet will be cancelled. 18.16. We offer you the ability to bet in play on a variety of global sporting events and while we do make every effort to ensure all live betting information is accurate, there may be situations where such information is incorrect, due to delays or otherwise. When checking live betting odds, live event start times or any other live event markets, please be aware that such information is provided as a guide only and we accept no liability for the outcome of any inaccuracies which may occur. It is the sole responsibility of the customer to check such information is accurate at the time of publication. 18.17. The official result is final for settlement purposes except where specific rules state the contrary. The podium position in Grand Prix racing, the medal ceremony in athletics and any similar official ceremony or presentation in other sports are to be treated as the official result. 18.18. Winnings will be credited to the customer’s account following confirmation of the final result. 18.19. We reserve the right to void any or all bets made by any person or group of persons acting in an attempt to defraud us. 18.20. We reserve the right to void any bet that may have been accepted when the account did not have sufficient funds to cover the bet. If an account has insufficient funds as a result of a deposit that has been cancelled by the payment processing party, we reserve the right to cancel any bet that may have been accepted retroactively. 19.1. For the purposes of this Section ‎20, the maximum winnings from sports betting are exclusive of the stake which you place. 19.2. Subject to Section ‎20.5, the maximum amount of winnings which is payable to you with respect to any bet on our sports products and services is £90,000 (ninety thousand pounds) (the "Maximum Win Per Bet"). By way of example, if you win £100,000 (one hundred thousand pounds) on a bet on our sports products and services (without the application of the Maximum Win Per Bet cap), the actual winnings credited to your Player Account will be capped at £90,000 (ninety thousand pounds). 19.3. Subject to Section ‎20.5, the maximum amount of winnings which is payable to you with respect to bets on our sports products and services in any calendar month is £90,000 (ninety thousand pounds) ("Maximum Winnings Per Month"). By way of example, if you win £120,000 (one hundred thousand pounds) on a bet or series of bets on our sports products and services (without the application of any cap on winnings) in a particular calendar month, the maximum winnings on such bets credited to your Player Account will be capped at £90,000 (ninety thousand pounds). 19.4. Notwithstanding Sections ‎20.2 and ‎20.3, we reserve the right not to accept any bet if the winnings for such bet will cause the Maximum Win Per Bet and/or Maximum Winnings Per Month limits to be exceeded. 19.5. If we reasonably believe that you are acting together with another player or group of players in placing bets on our sports products or services containing the same or related selections on particular event(s), we shall be entitled to apply the Maximum Win Per Bet and the Maximum Winnings Per Month caps to the aggregate of the winnings from the relevant bets placed by you and the other players, whom we reasonably believe to be acting together, as if such bets were placed by you alone rather than applying the Maximum Win Per Bet and Maximum Winnings Per Month caps separately to the winnings of each individual player. 19.6. If you have placed several identical bets (single bets or combination bets, single or multiple) and the winnings exceed the Maximum Winnings Per Month, we may reduce the stakes that you have placed on these bets so that the winnings are within such limits. 19.7. Where you place a bet on a sport which is regulated by a sports governing body included in Part 3 Schedule 6 of the Gambling Act 2005 or published on the Gambling Commission's website (each a “Sports Governing Body”), in order for your bet to be accepted as a valid bet by us, you must not be in breach of any rules concerning irregular and/or suspicious betting or misuse of information relating to: (i) the applicable Sports Governing Body; (ii) any other professional body of which You are a member of; or (iii) your employers. If we suspect you are in breach of the foregoing, we reserve the right to void the relevant bet. 20.1. A number of bets may be treated as being one when a Customer places multiple copies of the same bet. When this occurs all bets may be voided apart from the first bet struck. A number of bets that contain the same single selection may be treated as being one. When this occurs all bets may be voided apart from the first bet struck. An example would be where 1 particular selection is repeatedly included in multiple bets involving other short-priced selections. 20.2. Where there is evidence of a series of bets each containing the same (or very similar) selection(s) having been placed by or for the same individual or syndicate or individuals, we reserve the right to make bets void and suspend relevant accounts. This rule applies to both settled and unsettled bets. 20.3. If you have played in a professional capacity, or in tandem with other customer(s) as part of a club, group, etc., or placed bets or wagers in a coordinated manner with other customer(s) involving the same (or materially the same) selections; in this instance we further reserve the right, at our sole discretion, to restrict the total maximum pay out for the combined total of any such bets, to the equivalent of the Maximum Winnings Per Month limit permitted for a single Customer (as outlined at section 20 above). Aspire Global International LTD is for sole use on an individual basis and for personal entertainment only. 20.4. We allow only one account per person. Any subsequent accounts opened under the same postcode/personal details/IP address that are found to be related to any existing account may be closed immediately and any bets will be voided at our discretion. We reserves the right to reclaim any winnings attained by these means and we reserve the right to withhold all or part of your balance and/or recover from your account deposits, pay outs, bonuses, any winnings that are attained by these means. PLEASE PRINT AND RETAIN A HARD COPY OF THIS AGREEMENT FOR YOUR RECORDS. 1.1 AG Communications LTD ("us", "we" "our" or the "Company") is incorporated under the laws of Malta, which is licensed by the Gambling Commission for the purposes of operating and offering internet gambling services in Great Britain. 1.2 PLEASE ENSURE THAT YOU READ CAREFULLY AND UNDERSTAND THESE TERMS OF SERVICE BEFORE YOU START TO USE THE SERVICES AND/OR SOFTWARE. THE TERMS OF SERVICE CONTAIN IMPORTANT INFORMATION ABOUT THE LEGAL AGREEMENT BETWEEN YOU AND US, AND PROVIDE INFORMATION ABOUT WHAT OTHER POLICIES FORM PART OF OUR RELATIONSHIP WITH YOU. 1.3 Please note that the Agreement (as defined below) constitutes a legally binding agreement between you and us. By registering with us and/or by using the Services (as defined below) and/or Software (as defined below), you agree to be bound by the Agreement. The Agreement will govern your use of the Site, Services and Software. If you do not agree to any of the provisions of the Agreement (as defined below) you should immediately stop using the Site, Services and Software. 1.5.1. Responsible Gaming Policy - information contained in this policy relates to preventing compulsive gambling, setting self-limits and how to self-exclude. 1.5.2. Cash Out Policy - information is contained in this policy regarding how you may withdraw real money funds from your Player Account. 1.5.3. Bonus Policy - information is contained in this policy with regards to bonuses and promotions which we may run from time to time. 1.5.4. Sports Betting Rules which can be found here - the rules contain information with regards to the use of our betting on our sports products and services. 1.6. IF YOU DO NOT AGREE TO ANY OF THE PROVISIONS OF THE AGREEMENT YOU SHOULD IMMEDIATELY STOP USING THE SITE, SERVICES AND SOFTWARE. 1.7. We may suspend, modify, remove or add to the Services and/or Software at any time. We provide you with introductory information about the Terms of Service and further terms and conditions that will apply to you. We provide you with information regarding some of the defined terms used in the Terms of Service and how you are to read the phrases in the agreement. We provide you with information with regards to your uses of the services and identity verification. We provide you with information regarding the use of your Player Account. We provide you with information with regards to activates which are not permitted. We provide you with information regarding how your Player Account and the Agreement can be terminated. We provide you with information on what happens on termination of your Player Account. We provide you with information on how you can make payments and with how we handle payments from you. We provide you with information on how a complaint can be made by you and how it is resolved. We provide you with information in what instances we will be liable to you and limitation on our liability. This section sets out when you will be responsible for compensating us and White Label Partners. We provide you with information on how we may amend the Agreement. We provide you with information regarding promotions. We provide you with information general terms and conditions which apply to the Agreement. We provide you with information regarding the law that governs our relationship with you. We provide you with information with regard to jackpot winnings. We provide you with additional information regarding the use of the sports betting products and services. We provide you with information regarding limitations on your winnings regarding sports betting. We provide you with additional information regarding fraud and collusion with regards to sports betting products and services. Agreement has the meaning given to it in Section ‎1.5. Additional Policies has the meaning given to it in Section ‎1.5. Bank Account has the meaning given to it in Section ‎5.6. Intellectual Property has the meaning given to it in Section ‎4.2. Gambling Commission means the regulator of commercial gambling in Great Britain whose website is located at www.gamblingcommission.gov.uk. Maximum Win Per Bet has the meaning given to it in Section ‎20.2. Maximum Winnings Per Month has the meaning given to it in Section ‎20.3. 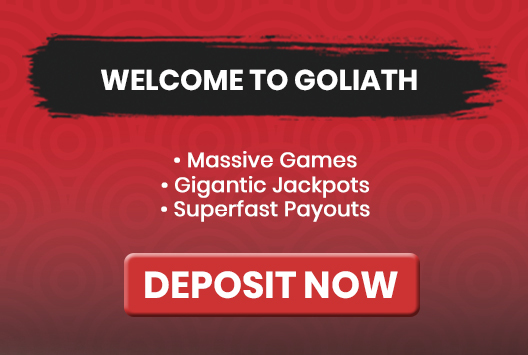 Site means the website located online at Goliathcasino and its related mobile/tablet application. .
Site Content has the meaning given to it in Section ‎4.3. Software means the software used by us to make the Services available to you through the Site. Services means the online gambling services made available to you through the Site. Player Account means the account opened by a person with us through the Site which enables you to use the Software and/or Services. us, we, our or the Company has the meaning given to it in Section ‎1.1. User Name and Password means the username and password for your Player Account, which you choose when you register to use the Services. White Label Partner means an entity which is not part of our corporate group who owns the Site which is operated by us. you, your or yours shall refer to the user of the Services, the Software and/or the Site. 2.1. In the Agreement any phrase introduced by the terms "inclusive" "including", "include", "in particular" or any similar expression shall be construed as illustrative and shall not limit the sense of the words preceding those terms. 2.2 The headings in this Terms of Service are for ease of reference only and shall not affect its construction. 2.3 In this Agreement, if the context so requires, references to the singular shall include the plural and vice versa. 3.1 The Services and Software are intended to be used by you if you play with us or register with us in the United Kingdom. 3.2 We will not be responsible if you use the Services in an illegal manner or in a way which is not authorized by us. 3.3 If you are under the age of 18 and gamble you are committing a criminal offence in the United Kingdom. 3.4 We reserve the right at any time to request from you proof of your age so that we may verify that you are at least 18 years of age. 3.5.2 no further gambling will be permitted until we have successfully verified your age. Furthermore, in circumstances which give us reason to suspect that you may be underage, we may freeze the balance of your Player Account until your age is successfully verified. 3.6.4 e shall terminate this Agreement. 3.7 During their engagement period and for a period of 24 months thereafter: (i) no officer, director, employee, consultant or agent of ours, or any other company within our corporate group; and/or (ii) any of our or any other company within our corporate group's suppliers, vendors or White Label Partners, is permitted to use the Services directly or indirectly. This restriction also applies to relatives of such persons and for this purpose 'relative' means any spouse, partner, parent, child or sibling. 3.8 You are fully aware that there is a risk of losing money when gambling by means of the Services and/or Software. 3.9 You shall access the Software and use the Services only via your Player Account. 3.10 You may at your discretion choose to exclude yourself from using the Services for a definite or an indefinite period. For further information please see our Responsible Gaming Policy. 4.1 You may only use the Site and/or the Software and all content which is made available through the Site and/or the Software in connection with your own personal non-commercial use in accordance with the terms of the Agreement. 4.2 All rights in the logos, designs, trademarks, brands, brand names, services marks and trademarks ("Intellectual Property") used on the Site belong to us, to a company within our corporate group, the White Label Partner or to our licensors (as applicable). 4.3 In addition, we, a company within our corporate group, the White Labe Partner or our licensors (as applicable) own the rights in all other content of the Sites including, but not limited to, the Software, images, pictures, graphics, photographs, animations, videos, music, audio and text (the "Site Content"). 4.4 Your use of the Services or the Site will not give you any rights to the Intellectual Property or the Site Content. 5.1 In order to use the Services, you must have a Player Account. 5.2.16. You will not place a single bet which exceeds the total amount of bonus money and real money in your Player Account. 5.2.25. You will not collude with another player to gain an unfair advantage against us or any other player. 5.3 You will not transfer funds from your Player Account to another Player Account. 5.4 In case the reason behind the closure of your Player Account is related to concerns about possible gambling addiction you shall indicate it. If you request to close your Player Account you may undergo retention attempts, unless we are not permitted for legal or regulatory reasons. Retention procedures include without limitation contacting you through different channels for clarifying the reason for the request and specific treatment in order to solve possible problems and to improve customer satisfaction. 5.5 Any funds you deposit with us are held in a bank account in our name (the "Bank Account") which is separate from our corporate funds. This will not provide complete protection for your funds if we become insolvent. If we become insolvent and are put into liquidation, our assets and liabilities (including those in the Bank Account) shall be handled in accordance with the laws of Malta. The above measures for the protection of customer funds protection measures meet the "Basic Level" of the Gambling Commission's customer funds rating system. For more information about the protection of customer funds please see the UK Gambling Commission website here. click here. 5.6 Your Player Account is made up of a real money funds balance and a bonus funds balance. If you have both real money funds and bonus funds in your Player Account, the next wager you make will use real money funds first. If your you place a bet where the real money funds in your Player Account is not sufficient to cover such bet and you use bonus funds to cover the rest of such bet, your winnings from any such bet placed by you, will be paid to you in proportion to the real money funds and bonus funds you have used to place such bet. By way of example only, if you place a bet of £10 (ten pounds), of which such bet is made up of £4 (four pounds) from your real money balance and £6 (six pounds) from your bonus balance and such bet generates a win of £30 (thirty pounds), your Player Account will be credited with £12 (twelve pounds) to your real money balance and £18 (eighteen pounds) in bonus funds to your bonus balance. All such winnings generated by bonus funds will be subject to the terms of the Bonus Policy. 6.1. If we have reasonable grounds to believe that you have engaged and/or are engaging in any Prohibited Practices, Fraudulent Activity and/or Unlawful Activity with regards to the Software and/or Services, we shall be entitled to close Your Account and terminate the Agreement. (x) any other similar or related behaviour, practice or activity to that described in (i) - (ix) above and/or any other behaviour, practice or activity which represents, in our reasonable opinion, a material breach of the terms and conditions set out in the Agreement. (ii) any action which is intended to (or does) defraud us or any other third party (including any other user of the Services). (viii) any other fraudulent activity in the course of your use of the Services. "Unlawful Activity” has the meaning given to it in Section 6.1. 6.2. We reserve the right to inform relevant authorities, other online gaming or gambling operators, other online service providers and banks, credit card companies, electronic payment providers and/or other financial institutions of your identity and of your engagement or attempted engagement in any Prohibited Practices, Fraudulent Activity and/or Unlawful Activity. You agree to fully cooperate with us with our investigation into any such Prohibited Practices, Fraudulent Activity and/or Unlawful Activity and acknowledge that we may also disclose your identity and information on your engagement or attempted engagement in any Prohibited Practices, Fraudulent Activity and/or Unlawful Activity to any third party engaged by us to assist us in any investigation we carry out. 7.1. You may close your Player Account and terminate the Agreement at any time, by contacting us at care@Goliathcasino.com and we shall terminate your Player Account within 7 days of our receipt of such request to the email address care@Goliathcasino.com. The Agreement will terminate when we close your Player Account, You will be responsible for any activity on your Player Account until we close your Player Account. 7.2.5. in accordance with Section 3.6 and/or ‎9.6. In the event that we are to stop: (i) providing the Services and/or Software through the Site; or (ii) making the Site available, we shall provide you with reasonable prior notice of our intention to do so. 7.3. On termination of the Agreement, you will immediately stop using the Services, Software and the Site and you will promptly pay all amounts which you owe to us when requested in the manner that you would normally do so or as otherwise directed by us. 9.1 You may cash out from your Player Account in accordance with the Cash Out Policy. 9.2. You understand that all financial account transactions will be handled by us, or third party electronic payment processors and/or financial institutions on our behalf and checks on financial account transactions shall be done to prevent money laundering. We reserve the right to run credit checks with third parties using the information submitted to us by you through the opening of the Player Account. 9.3. We reserve the right to refuse accepting and paying through any means of payment, such as certain credit cards, personal checks, electronic wallets and any other types of payment methods, in accordance with our Deposits Table and Cash Out Policy. 9.4. We reserve the right to credit you back using the same method as you have previously deposited with, for as long as the method so used allows, as per our Cash Out Policy. 9.5. We may, at any time, set off any positive balances in your Player Account against any amount owed by you to us. By way of example, in the event that following the settlement of a bet in your Player Account a resettlement is required, we reserve the right to deduct from your Player Account any required amount of money. 9.6. All payments into your Player Account must be from a single payment source, such as a credit card, debit card or charge card, on which you are the named account holder. Should you use a credit/debit card or any other form of payment which is not in your private and personal name, we retain the right to request further information and documentation from you and from the third party to confirm that you are duly authorised to use that payment method. We will temporarily block your Player Account so that no further deposits and/or withdrawals may be made until we receive the requested documentation and are satisfied that you are duly authorised to use the payment method in question. If you are unable to provide us with satisfactory proof of your authority to use the third party's payment method, then we reserve the right to terminate your Player Account and the Agreement. In such instance, we will cancel all of your open bets yet to be settled at the time of your Player Account termination. We also reserve the right to delay or withhold the payment to you of any real money funds on receipt of a withdrawal request from you where and to the extent that this is required in order to comply with our legal and regulatory requirements. 9.7. Deposit limits may apply depending on the payment method being used. Please see our Deposit Table for further information. 9.8. We reserve the right to charge you administrative fees during your deposits and withdrawals as shall be detailed in the "Cashier." 10.1 If you have a complaint, you can contact us at:care@Goliathcasino.com. We will seek to resolve a reported matter promptly. Complaints will be escalated internally according to the urgency and nature of the complaint, and once a solution has been identified it will be made known to you as soon as reasonably possible. 10.2. If your complaint relates to the outcome of a gambling transaction and for some reason you are not satisfied with the resolution of your complaint by us within 8 weeks of us having received your complaint and where you have cooperated with us in relation to the complaints process in a timely manner, you may refer the dispute free of charge to the Independent Betting Adjudication Service (IBAS) Where you refer your claim to IBAS you should do so promptly. More information regarding IBAS's dispute resolution services can be found at www.ibas-uk.com. For an adjudication form please send an email to: ibas-uk.com/adjudicationForm. 10.3. Our complaints procedure does not stop you from filing a claim with the courts in accordance with Section ‎17 or from filing a complaint via the European Commission's Online Dispute Resolution Platform available at europa.eu/consumers/odr. 10.4. The complaints procedure will not affect any rights which you may have under applicable law. 11.1. We will provide the Services with reasonable skill and care to you and within a reasonable time and nothing under this Agreement (including this Section 11) shall exclude, limit or restrict our liability for any failure to do so. You have certain legal remedies if we breach any of these rights which may apply irrespective of the terms of the Agreement. 11.2.6. the Software and/or Servicers are free from bugs. 11.3.4. if we stop making the Software and/or Services available to you. 11.4.8. any event which is outside our reasonable control, this includes any telecommunications network failures, power failures, failures in third party computer (or other) equipment, cyber-attack fire, lightning, explosion, flood, severe weather, industrial disputes or lock-outs, terrorist activity and acts of government or other competent authorities. 11.5.2. in respect of any other liability, 1,000 (one thousand pounds)..
(collectively and individually an "Error "). We shall use reasonable endeavours to detect and notify you of any Error as soon as reasonably practicable. If we reasonably believe that you have received any winnings and/or bonuses as a result of an Error, we may cancel any winnings and/or bonuses and void any game and bet affected by the Error. have no liability to you for any loss of winnings and/or bonuses in the event that any game or bet is voided or otherwise affected by an Error. 11.8. Nothing in the Agreement will exclude any liability which we have to you which may arise from negligence causing death or personal injury; or from fraud or fraudulent misrepresentation. You will compensate us and the White Label Partner (where applicable) for any loss, damages and costs that we and/or the White Label Partner suffers as a result of your breach of Section ‎6.1. 13.1. We reserve the right to amend the Agreement at any time and we will notify you of any such amendment by publishing a new version of the Agreement on this page of the Site. We may amend the Agreement, including for commercial reasons, security reasons to comply with law or regulations, to comply with instructions, guidance or recommendations from a regulatory body, or for customer service reason. Any modified version of the Agreement will come into effect 14 days after its publication on this page of the Site. We encourage you to re-visit this page frequently to be updated of any amendments to the Agreement. 13.2. We will provide prior notice to you through your Player Account of substantial changes of this Agreement and/or we will send you an email regarding such changes to the email address linked to your Player Account. 13.3. If you disagree with any amendment made to this Agreement, you should immediately cease using the Services and Software and terminate your Player Account in accordance with Section ‎7.1. 14.1.1. You shall not make any statements that are sexually explicit or offensive, including expressions of bigotry, racism, hatred or profanity. 14.1.2. You shall not make statements that are abusive, defamatory or harassing or insulting to any other person who use the Services and/or to the people who provide you with customer support. 14.1.3. You shall not make statements that advertise, promote or otherwise relate to any other website and/or company. 14.1.4. You shall not make statements about us, the Services, the Software, the Site, or any other Internet site(s) connected to us that are untrue and/or malicious and/or damaging to us. 14.1.5. You shall not collude through the chat rooms or separate chats. 14.2. PLEASE NOTE: When using the chat facility any personally identifiable information that you submit, can be read, collected, or used by other users of the Services who may use such information to send you messages which you have not asked for. We shall not be responsible for the personally identifiable information that you choose to submit via the chat facility. 14.3. Suspicious chats may be reported to the appropriate authorities. 15.1. We may offer, from time to time, bonuses and/or promotions to you. You can find more information with regards to our bonuses in the Bonus Policy and the Promotions page. 15.2. With regards to the promotions, these may be subject to their own terms and conditions. Subject to the wagering restrictions set out in Section ‎20 and save in circumstances where we reasonably believe you have engaged in any Prohibited Practice, Fraudulent Activity or Unlawful Activity or as otherwise required by us to comply with any legal and/or regulatory requirement, we shall not impose any additional restriction on the stakes that you may wager on our sports betting product after you have made one or more qualifying bets required by any free bet promotion where such additional restriction affects your ability to complete the wagering requirements for that free bet promotion or otherwise receive any of the free bets (or the full expected value of the free bets) from that free bet promotion (an “Additional Account Restriction”). In the event that we do seek to impose on you an Additional Account Restriction, we shall credit you with the full expected value of the free bets from the relevant free bet promotion, to which you would have been entitled had you placed the relevant qualifying bets. 16.1. You agree that we may, at our sole discretion, transfer our obligations under the Agreement in whole or in part to any person without notice to you, provided that any such transfer will be on the same terms or terms that are no less advantageous to you. 16.2. If any part of the Agreement is determined by any competent authority to be invalid, unlawful or unenforceable, the other provisions of the Agreement shall continue to be in force. Such invalid, unlawful or unenforceable term, shall be interpreted as closely as possible to its original aim. 16.3. The Agreement is the entire agreement between you and us with respect to the Site, the Services and/or the Software. 16.4. These Terms of Service have been prepared in various languages other than English for reference only. In the event of any differences between the English version of these Terms of Service and any non-English versions, the English version shall prevail. 16.5. Nothing in the Agreement shall be construed as creating any agency, partnership, or any other form of joint enterprise between you and us. 16.6. No waiver by us of any term of this Agreement shall be construed as a waiver of any prior or following breach of any term of this Agreement. 16.7. Unless otherwise expressly stated in the Agreement, nothing in this Agreement shall create or confer any rights or any other benefits to third parties. This Agreement and the relationship between you and us will be governed by, and interpreted in accordance with the laws of England and Wales. If you wish to take court proceedings against us you must do so in the courts located in England and Wales. Jackpot prizes shall be awarded to the winners only after being validated. 19.1. These Betting Rules are inseparably linked to our Terms & Conditions, of which they form a part, and acceptance of these Betting Rules is a prerequisite to account registration. Any capitalized terms used herein which are not defined shall take their meaning from the Terms & Conditions. 19.2. The minimum amount you may wager on our sports betting products is £0.10. Your maximum amount for a bet differs between sports, leagues and bets. You will see the exact value specified in the field where you enter the stake amount, when placing a bet. We make no guarantee that any bet placed within or for the maximum stake shall be accepted. Terms & Conditions. 19.3. We reserve right to refuse the whole or any part of any bet request for any reason and at our sole discretion. Individual bet requests may be reviewed and an alternative price or stake offered at our sole discretion. 19.4. We accept bets made online. Bets are not accepted in any other form (email, telephone, fax, etc.) and if received will be void, win or lose. 19.5. We reserve the right to refuse/cancel any bet or part of a bet before the game starts and to make ambiguous bets void, without providing any justification. 19.6. Customers cannot cancel or change a bet once the bet has been placed and confirmed. 19.7. Bets will be accepted up to the advertised start time. If a bet is inadvertently accepted which includes an event after its start time, unless it is a live-betting event, the match/bet will be treated as a non-runner. 19.8. Irrespective of which betting odds format you select for odds to be shown in your customer account, all bets will be settled based on American odds. 19.9. Where we have reason to believe that a bet is placed after the outcome of an event is known or after the selected participant or team has gained a material advantage (e.g. a score, sending off etc.) we reserve the right to void the bet, win or lose. 19.10. We reserve the right to cancel any bets from customers who place money on an event where they are in any way involved, as participants, referee, coach etc. 19.11. We reserve the right to withhold payment and to declare bets on an event void if we have evidence that the following has occurred: (i) the integrity of the event has been called into question or (ii) match rigging has taken place. Evidence may be based on the size, volumes or pattern of bets placed with Aspire Global International LTD across any or all of our betting channels. 19.12. When an event is cancelled, all related bets will be void automatically and accounts refunded. 19.13. If any match is abandoned due to injury, bad weather, crowd trouble etc. all bets that have already been settled up until the time of abandonment will stand. For example: If a football match is abandoned in the second half, all bets involving the 1st half will stand. What’s more, if there has been a goal scored, the first goal scorer market will stand, but the last and any time goal scorer bets will be void. For tennis: if a player retires injured in the 3rd set, all bets to win the 1st and 2nd sets will stand. 19.14. We do not accept any responsibility for typing, human or palpable errors, which lead to obvious price errors. In such cases all bets will be deemed void. 19.15. Multiple bets that combine different selections within the same event are not accepted where the outcome of one affects or is affected by the other. If such a bet is taken in error, the bet will be cancelled. 19.16. We offer you the ability to bet in play on a variety of global sporting events and while we do make every effort to ensure all live betting information is accurate, there may be situations where such information is incorrect, due to delays or otherwise. When checking live betting odds, live event start times or any other live event markets, please be aware that such information is provided as a guide only and we accept no liability for the outcome of any inaccuracies which may occur. It is the sole responsibility of the customer to check such information is accurate at the time of publication. 19.17. The official result is final for settlement purposes except where specific rules state the contrary. The podium position in Grand Prix racing, the medal ceremony in athletics and any similar official ceremony or presentation in other sports are to be treated as the official result. 19.18. Winnings will be credited to the customer’s account following confirmation of the final result. 19.19. We reserve the right to void any or all bets made by any person or group of persons acting in an attempt to defraud us. 19.20. We reserve the right to void any bet that may have been accepted when the account did not have sufficient funds to cover the bet. If an account has insufficient funds as a result of a deposit that has been cancelled by the payment processing party, we reserve the right to cancel any bet that may have been accepted retroactively. 20.1. For the purposes of this Section ‎20, the maximum winnings from sports betting are exclusive of the stake which you place. 20.2. Subject to Section ‎20.5, the maximum amount of winnings which is payable to you with respect to any bet on our sports products and services is £90,000 (ninety thousand pounds) (the "Maximum Win Per Bet"). By way of example, if you win £100,000 (one hundred thousand pounds) on a bet on our sports products and services (without the application of the Maximum Win Per Bet cap), the actual winnings credited to your Player Account will be capped at £90,000 (ninety thousand pounds). 20.3. Subject to Section ‎20.5, the maximum amount of winnings which is payable to you with respect to bets on our sports products and services in any calendar month is £90,000 (ninety thousand pounds) ("Maximum Winnings Per Month"). By way of example, if you win £120,000 (one hundred thousand pounds) on a bet or series of bets on our sports products and services (without the application of any cap on winnings) in a particular calendar month, the maximum winnings on such bets credited to your Player Account will be capped at £90,000 (ninety thousand pounds). 20.4. Notwithstanding Sections ‎20.2 and ‎20.3, we reserve the right not to accept any bet if the winnings for such bet will cause the Maximum Win Per Bet and/or Maximum Winnings Per Month limits to be exceeded. 20.5. If we reasonably believe that you are acting together with another player or group of players in placing bets on our sports products or services containing the same or related selections on particular event(s), we shall be entitled to apply the Maximum Win Per Bet and the Maximum Winnings Per Month caps to the aggregate of the winnings from the relevant bets placed by you and the other players, whom we reasonably believe to be acting together, as if such bets were placed by you alone rather than applying the Maximum Win Per Bet and Maximum Winnings Per Month caps separately to the winnings of each individual player. 20.6. If you have placed several identical bets (single bets or combination bets, single or multiple) and the winnings exceed the Maximum Winnings Per Month, we may reduce the stakes that you have placed on these bets so that the winnings are within such limits. 20.7. Where you place a bet on a sport which is regulated by a sports governing body included in Part 3 Schedule 6 of the Gambling Act 2005 or published on the Gambling Commission's website (each a “Sports Governing Body”), in order for your bet to be accepted as a valid bet by us, you must not be in breach of any rules concerning irregular and/or suspicious betting or misuse of information relating to: (i) the applicable Sports Governing Body; (ii) any other professional body of which You are a member of; or (iii) your employers. If we suspect you are in breach of the foregoing, we reserve the right to void the relevant bet. 21.1. A number of bets may be treated as being one when a Customer places multiple copies of the same bet. When this occurs all bets may be voided apart from the first bet struck. A number of bets that contain the same single selection may be treated as being one. When this occurs all bets may be voided apart from the first bet struck. An example would be where 1 particular selection is repeatedly included in multiple bets involving other short-priced selections. 21.2. Where there is evidence of a series of bets each containing the same (or very similar) selection(s) having been placed by or for the same individual or syndicate or individuals, we reserve the right to make bets void and suspend relevant accounts. This rule applies to both settled and unsettled bets. 21.3. If you have played in a professional capacity, or in tandem with other customer(s) as part of a club, group, etc., or placed bets or wagers in a coordinated manner with other customer(s) involving the same (or materially the same) selections; in this instance we further reserve the right, at our sole discretion, to restrict the total maximum pay out for the combined total of any such bets, to the equivalent of the Maximum Winnings Per Month limit permitted for a single Customer (as outlined at section 20 above). Aspire Global International LTD is for sole use on an individual basis and for personal entertainment only. 21.4. We allow only one account per person. Any subsequent accounts opened under the same postcode/personal details/IP address that are found to be related to any existing account may be closed immediately and any bets will be voided at our discretion. We reserves the right to reclaim any winnings attained by these means and we reserve the right to withhold all or part of your balance and/or recover from your account deposits, pay outs, bonuses, any winnings that are attained by these means.